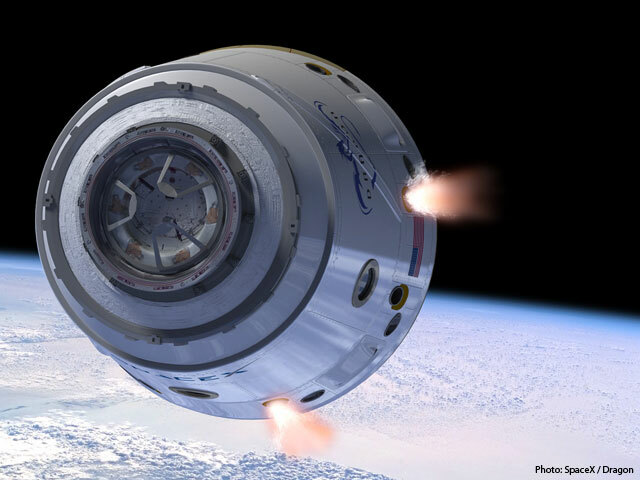 Home » Science/Tech » NASA and SpaceX To Launch First Private Space Station! Private sector is moving into space too, NASA and commercial space company SpaceX will discuss plans to launch the first private spaceship to the International Space Station during a press conference Monday (April 16). The briefing will follow a meeting among mission managers to decide whether the spacecraft is ready to lift off as planned April 30. SpaceX is the first firm scheduled to launch its unmanned vehicle to the station under NASA’s Commercial Orbital Transportation Services (COTS) program aimed at stimulating the development of private vehicles to take over the duties of the retired space shuttles. The time for Monday’s briefing, to be held at NASA’s Johnson Space Center in Houston, has not yet been set, but it will follow the Flight Readiness Review meeting due to wrap up in the early afternoon. SpaceX’s Dragon capsule is slated to blast off atop the company’s Falcon 9 rocket from the Cape Canaveral Air Force Station in Florida. The craft will be carrying food, supplies and scientific experiments for the orbiting outpost. Before Dragon can link up with the station, mission managers will run the vehicle’s sensors and flight systems through a series of check outs. If all looks good, the capsule will slowly approach the space station until astronauts inside can reach out and grab it with the facility’s robotic arm to connect it to the station’s Harmony node. The press conference will be broadcast live on NASA Television here: http://www.nasa.gov/ntv. Next: Rock And Roll Hall Of Fame, 2012 Induction Ceremony! This is amazing! I hope they will be able to launch this on April 30th. And everything will sail smoothly!